The liver is the largest internal organ in the body and it carries out a bewildering array of vital metabolic tasks. Many of the functions of the liver are influenced by diet. Some constituents of the diet can cause the liver to have to perform additional work in order to maintain a healthy internal environment. Other ingredients if provided in increased levels can actually help support liver function. 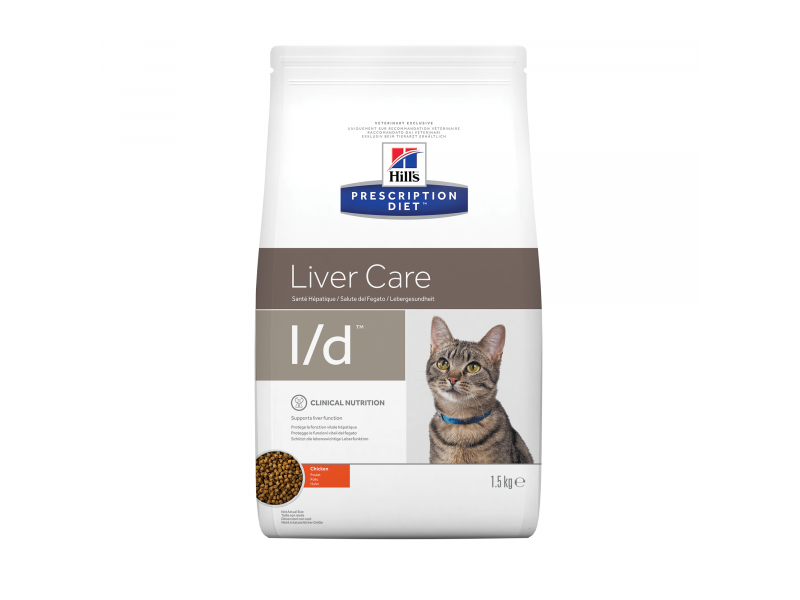 Hills prescription diet feline l/d is for the nutritional management of cats with liver disorders. Liver disorders are often serious conditions frequently accompanied by many uncomfortable and even painful symptoms for your cat. Hills prescription diet l/d was created specifically for the nutritional management cats with liver disorders that cause reduced liver function. Because the liver works to rid the body of toxins, it can be subjected to damage and reduced function from infections and ingested poisons as well as altered blood flow. Balanced Reduces workload on liver. Helps reduce accumulation of ammonia and consequent CNS signs (hepatic encephalopathy). Vitamin K Increased Helps reduce the risk of deficiencies common in liver disorders. Copper controlled Helps reduce copper accumulation in the liver. L-Carnitine Supplemented Helps improve fat metabolism to limit hepatic lipidosis. Soluble fibre Supplemented Helps decreases ammonia reabsorption (and ammonia generation) in the bowel. Sodium Reduced Helps limits portal hypertension and ascites. Helps control clinical signs associated with sodium and fluid retention. Potassium Increased Helps avoids hypokalaemia which can trigger CNS signs. Arginine Increased Helps maintain urea cycle, avoiding accumulation of ammonia. Taurine High Helps maintain normal heart muscle function. Superior antioxidant formula Added Neutralises free radicals associated with liver disorders. Ingredients: Chicken: Maize, chicken (30%) and turkey meal, animal fat, maize gluten meal, dried whole egg, brewers´rice, flaxseed, dried beet pulp, digest, minerals, vitamins, L-carnitine, cellulose, trace elements, taurine, L-arginine and beta-carotene. With a natural antioxidant (mixed tocopherols). Pork liver, maize gluten meal, rice flour, pasta, vegetable oil, soybean meal, animal fat, dried whole egg, soy fibre, digest, fish oil, dicalcium phosphate, cellulose, potassium chloride, L-lysine hydrochloride, calcium sulphate, L-arginine, taurine, iodised salt, calcium carbonate, DL-methionine, L-carnitine supplement, vitamins and trace elements. For hepatic lipidosis without encephalopathy or primary liver disease: Prescription Diet™ a/d™ Canine/Feline. Hepatic lipidosis (with encephalopathy or primary liver disease). Below are some recent questions we've received regarding Hill's Prescription Diet l/d Liver Care Chicken Dry Cat Food, including answers from our team. Would this be safe for a 6 week old kitten with possible liver shunt to eat? She can't have lactulose meds as too young and dehydration risk at the moment. Still bottle feeding and won't eat yoghurt/ cottage cheese etc. Doesn't like royal canin hepatic biscuits mushed up. At a loss what to give her apart from babycat milk and baby rice. Hills LD would be a reasonable choice of food to include in her diet at this stage, though ultimately you will probably need to get a full and accurate diagnosis before you can be sure of the best treatment and management options. It might not be as palatable as some of the more standard diets, but if she has a liver shunt this diet should be better for her. You might have to mash it up with a little warm water to help her to take to it. Cats know what they want and can be amazingly fussy sometimes. At least she ate a little of the new diet.As long as she is eating something, she will keep herself going. (To stop eating completely is not healthy for a cat, especially an overweight cat.) Cats tend to get used to foods in time and she will probably start to eat it better in future. I would persist with the new diet and not try to change it or add other things personally.